Chronic periodontitis is an infectious disease resulting in inflammation within the supporting tissues of the teeth, progressive attachment loss, and bone loss and is characterized by periodontal pocket formation and/or recession of the gingiva. Periodontitis has a multifactorial etiology, with the primary etiologic agents being pathogenic bacteria residing in the subgingival area. More than 700 different bacterial species colonize the oral cavity, but only a few of these are thought to be potential periodontal pathogens. Aggregatibacter actinomycetemcomitans, Porphyromonas gingivalis, and Tannerella forsythia are known as the main pathogens of periodontal disease, and treatment of periodontal disease is associated with success in removing and reducing these microorganisms. ,, Treatment of periodontal pocket is based on mechanical debridement of the tooth surface followed by proper maintenance of oral hygiene. Limitations of mechanical debridement are inability to access the periodontal pockets which leads to early microbial re-colonization and recurrence of the periodontal pocket. , Thus, local drug delivery systems (gels, microchip, fiber, etc.,) emerged into the market. Of the many herbal derivatives, Morus alba is one such plant which has garnered great attention because of its antioxidative, antidiabetic, antibacterial, antiviral, and anti-inflammatory properties. ,, M. alba also known as white mulberry is cultivated throughout the world, wherever silkworms are raised. The leaves of the white mulberry are the main food source for the silkworms. It is a popular medicinal plant that belongs to family Moraceae, and has long been used commonly in Ayurvedic and many of traditional systems of medicine. To the best of our knowledge, M. alba has been investigated for its use in dentistry only against pathogens causing dental caries. Hence, through this in vitro study, an attempt is made to explore the use of crude extract of M. alba in a sol-gel formulation against periodontal pathogens. Thus, the aim of the present study is to formulate and compare the thermosensitive sol-gel of M. alba with chlorhexidine against the periodontal microorganisms. Prior to the start of the study, ethical approval was obtained from recognized KLE University (Ref. no. KLEU/Ethic/14-15/D-79). This study is a part of the ongoing clinical trial. The chemicals used in the gel preparation are Pluronic f127, Pluronic f108, chlorhexidine gluconate solution, and methyl paraben. The entire chemicals were of IP grade. Leaves of M. alba were collected from Belgaum, Karnataka, India. The plant was authenticated from the taxonomist, Regional Medical Research Centre, ICMR (Voucher specimen is RMRC-988). The leaves were washed thoroughly in water and shade-dried. The dried leaves were coarsely ground. The coarse powder was extracted with solvent 99.9% of ethanol at room temperature using Soxhlet method of extraction. The extract was stored at 4°C until further use. 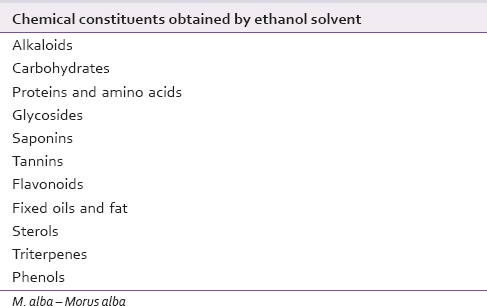 Freshly prepared crude extract of M. alba leaves using ethanol as a solvent was qualitatively tested for the presence of chemical constituents. Phytochemical screening of the crude extract was performed using the following chemicals and reagents. A fraction of the extract was treated with 3-5 drops of Wagner's reagent (1.27 g of iodine and 2 g of potassium iodide in 100 ml of water) and observed for the formation of reddish-brown precipitate (or coloration). A fraction of the extract was treated with aqueous 5% ferric chloride and observed for the formation of deep blue or black color. 2 ml of the extract was treated with 10% alcoholic ferric chloride solution and observed for the formation of blue or greenish color solution. To the test solution (0.5-1 ml), few drops of sodium hydroxide solution (10%) were added. Formation of an intense yellow color, which turns colorless on the addition of few drops of dilute sulfuric acid, indicates the presence of flavonoids. About 0.5-1 ml of the sample was taken in a test tube and it was boiled with 0.2% solution of ninhydrin. Appearance of violet color confirms the presence of proteins in the sample. About 5 ml of test solution was boiled with few drops of acetic anhydride, cooled, and then concentrated sulfuric acid was added along the sides of the test tube. Appearance of red color in the lower layer indicates the presence of sterols, whereas yellow color in the lower layer indicates the presence of triterpenoids. Few drops of Molisch's reagent were added to 2 ml of the various extracts. This was followed by a slow addition of 0.2 ml of concentrated sulfuric acid along the sides of the test tube. The mixture was then allowed to stand for 2-3 min. Appearance of a red or a dull violet color at the interphase of the two layers indicated a positive test. 1 g of the extract was dissolved in 10 ml of distilled water in a test tube and vigorously shaken for 1-2 min. Formation of honeycomb froth 1cm in height and lasting for a minimum of 30 minutes indicates the presence of saponins. 5 ml of each extract was treated with 2 ml of glacial acetic acid in a test tube and a drop of ferric chloride solution and 1 ml of concentrated sulfuric acid were added along the sides of the test tube. A brown ring at the interface indicated the presence of deoxysugar characteristic of cardiac glycosides. A violet ring may appear below the ring, while in the acetic acid layer, a greenish ring may form. A small quantity of extract was pressed between the filter paper. Appearance of oil stain on the paper indicated the presence of fixed oils. (ATCC 29523), P. gingivalis (ATCC 33277), and T. forsythia (ATCC 43037) were procured from Promochem, Bengaluru. The antimicrobial assay was determined by the agar well diffusion method. Antibacterial activity of the gels was determined on brucella agar medium. In a conical flask, 4.3 g of brucella agar base was suspended in 100 ml of distilled water. The conical flask was heated to boil to dissolve the medium completely. Later it was sterilized by autoclaving at 15 lbs pressure (121°C) for 15 min. It was cooled to 50°C (for T. forsythia, 100 μl of 0.001% of n-acetyl muramic acid was added) and then aseptically added 5% (v/v) sterile defibrinated sheep blood. It was mixed well before pouring into sterile Petri plates. The medium was poured into sterile disposable Petri plates. After the medium was solidified, plates were kept in a refrigerator until further use. The Petri plates were removed from the refrigerator and dried in an incubator at 37°C. A. actinomycetemcomitans, P. gingivalis, and T. forsythia were grown in thioglycollate broth mixed with horse serum, incubated for 48 h under anaerobic conditions. With the help of a micropipette, 50 μl of bacteria as per 0.5 McFarland standards were taken, spread on the agar plate, and lawn cultured with the help of a sterile swab. Two wells were made in the nutrient agar plate using a sterile cork borer measuring 4 mm depth and 6 mm diameter. In one well, 70 μl of chlorhexidine gel and in another well 70 μl of M. alba gel were filled with the help of micropipette. The plates were then incubated for 48 h in an anaerobic jar within 20-30 min of agar well diffusion. After incubation, the plates were observed for the zone of inhibition around the well and the diameters of the inhibition zones were measured in mm using a Hi antibiotic zone scale. The assay was carried out in triplicates and the result thus obtained is taken as the mean of the three readings. [Table 1] shows the qualitative phytochemical investigation of M. alba that showed the presence of alkaloids, carbohydrates, glycosides, saponins, sterols, triterpenes, fats and oils, phenols, tannins, flavonoids, proteins, and amino acids in ethanolic extract. [Table 2] shows the antimicrobial activity of sol-gels determined by agar well diffusion method. The sol-gel prepared by using M. alba and chlorhexidine exhibited potent antimicrobial activity toward all the periodontal pathogens. M. alba gel showed wider zone of inhibition (19 mm) against A. actinomycetemcomitans when compared to chlorhexidine gel (17 mm). Whereas chlorhexidine gel had a wider zone of inhibition (21 mm) compared to M. alba gel (12 mm) against T. forsythia. In the present in vitro study, thermosensitive/thermoreversible gels were formulated and antimicrobial activities of gels have been assessed for periodontal pathogens using agar well diffusion method. In the present study, the antibacterial activity of M. alba gel was found to be 19 mm, 16 mm, and 12 mm against standard strains of A. actinomycetemcomitans, P. gingivalis, and T. forsythia, respectively. Chlorhexidine gel was used as a positive control which is accepted as gold standard in dentistry. It has a broad spectrum of antimicrobial activity against a wide variety of bacteria (both Gram-positive and Gram-negative) and fungi. Its mechanism of action being decreasing the pellicle formation, alteration of bacterial adhesion to the tooth surface, and alteration of bacterial cell wall, ultimately leading to cell death. The most widely used concentration of chlorhexidine gel formulations available in the market is 1%. Hence, in the present study, the same concentration was used in the formulation of the gel. Antimicrobial activity of mucoadhesive gel prepared from the extract of Quercus brantii and Coriandrum sativum showed 17.23 ± 0.2 mm zone of inhibition against P. gingivalis, while M. alba sol-gel showed 16 mm. Literature reveals few studies of in vitro antibacterial activity of gel, as most of the studies of the gels have been in vivo. The antimicrobial activity of M. alba sol-gel could not be compared with other sol-gel as most of the gels have not been assessed for their antimicrobial activity against periodontal pathogens. In the present study, leaves of the M. alba plant have been assessed for its antibacterial activity and thus found to be effective against periodontal microorganisms. In another study, root bark of M. alba was found to possess antibacterial activity against periodontal pathogens like Actinobacillus actinomycetemcomitans and P. gingivalis with minimum inhibitory concentration of 1000 μg/ml and 8 μg/ml, respectively. Kuwanon C, Mulberrofuran G, and Albanol B present in the M. alba leaves showed strong antibacterial activity with minimum inhibitory concentrations ranging from 5 to 30 mg/ml. Therefore, all the parts of the M. alba plant were found to possess antibacterial activity. Phytochemical analysis of M. alba extract revealed the presence of all major bioactive compounds like tannins, flavonoids, saponins, and alkaloids. These bioactive compounds are known to act by a different mechanism and exert antimicrobial action. Tannins, belonging to polyphenol family, have been reported to possess the antibacterial activity against periodontal pathogens. Tannins precipitate microbial proteins and prevent the development of microorganisms. Polyphenols increase the antioxidant ability of oral fluids and prevent periodontal disease. Therefore, tannins present in M. alba extract might be responsible for exerting antimicrobial activity against periodontal pathogens. This promising gel might lead to a new avenue in the prevention and treatment of periodontitis. Although the antibacterial activity of sol-gel was assessed against periodontal pathogens, the concentration of each phytoconstituent and the chemical constituent that might be responsible for the activity was not determined. Further, in vivo studies should be conducted to know the effectiveness of M. alba sol-gel. The present study throws light on the formulation of thermoreversible gel using M. alba and assessing its antimicrobial activity against the most common periodontal pathogens A. actinomycetemcomitans, P. gingivalis, and T. forsythia. The study also concludes that M. alba leaves contain pharmaceutically important phytochemicals like tannins, flavonoids, triterpenes, alkaloids, saponins, phytosterols, carbohydrates, fats, and oils. We would like to thank Venus Ethoxyethers Pvt Ltd., Biocholim Ind. Estate, Goa, for providing Pluronic 127 and 108, Unilab Chemicals and Pharmaceuticals Pvt Ltd., Mumbai, for providing chlorhexidine gluconate solution, and Gujarat Organics Ltd., for providing Methyl paraben as gift samples. American Academy of Periodontology. Glossary of Periodontal Terms. 4 th ed. Chicago: American Academy of Periodontology; 2001. p. 40. Paster BJ, Olsen I, Aas JA, Dewhirst FE. The breadth of bacterial diversity in the human periodontal pocket and other oral sites. Periodontol 2000 2006;42:80-7. Cugini MA, Haffajee AD, Smith C, Kent RL Jr, Socransky SS. The effect of scaling and root planning on the clinical and microbiological parameters of periodontal diseases: 12-month results. J Clin Periodontol 2000;27:30-6. Slots J, Rams TE. New views on periodontal microbiota in special patient categories. J Clin Periodontol 1991;18:411-20. Socransky SS, Haffajee AD. The bacterial etiology of destructive periodontal disease: Current concepts. J Periodontol 1992;63 4 Suppl: 322-31. Caffesse RG, Sweeney PL, Smith BA. Scaling and root planning with and without periodontal flap surgery. J Clin Periodontol 1986;13:205-10. Greenstein G. Nonsurgical periodontal therapy in 2000: A literature review. J Am Dent Assoc 2000;131:1580-92. Choi HG, Jung JH, Ryu JM. Development of in situ gelling and mucoadhesive acetaminophen liquid suppository. Int J Pharm 1998;165:33-44. Lee SB, Cha KH, Kim SN, Altantsetseg S, Shatar S, Sarangerel O, et al. The antimicrobial activity of essential oil from Dracocephalum foetidum against pathogenic microorganisms. J Microbiol 2007;45:53-7. Lewis K, Ausubel FM. Prospects for plant-derived antibacterials. Nat Biotechnol 2006;24:1504-7. Khan R, Islam B, Akram M, Shakil S, Ahmad A, Ali SM, et al. Antimicrobial activity of five herbal extracts against multi drug resistant (MDR) strains of bacteria and fungus of clinical origin. Molecules 2009;14:586-97. Santos PR, Oliveira AC, Tomassini TC. Control microbiological products fitoterapices. Rev Farm Bioquim 1995;31:35-8. Havyarimana L, Ndendoung ST, Tamokou Jde D, Atchadé Ade T, Tanyi JM. Chemical constituents of Millettia barteri and their antimicrobial and antioxidant activities. Pharm Biol 2012;50:141-6. Kuorwel KK, Cran MJ, Sonneveld K, Miltz J, Bigger SW. Essential oils and their principal constituents as antimicrobial agents for synthetic packaging films. J Food Sci 2011;76:R164-77. Lokegaonkar SP, Nabar BM. In vitro assessment of the antiplaque properties of crude M. alba leaf extract. J Herb Med Toxicol 2011;5:71-7. El-Beshbishy HA, Singab AN, Sinkkonen J, Pihlaja K. Hypolipidemic and antioxidant effects of Morus alba L. (Egyptian mulberry) root bark fractions supplementation in cholesterol-fed rats. Life Sci 2006;78:2724-33. Chung KO, Kim BY, Lee MH, Kim YR, Chung HY, Park JH, et al. In-vitro and in-vivo anti-inflammatory effect of oxyresveratrol from Morus alba L. J Pharm Pharmacol 2003;55:1695-700. Kokate CK. Practical Pharmacognosy - Evaluation of Crude Drugs. 9 th ed. Pune: Nirali Prakashan; 2000. p. 122-4. Trease GE, Evans WC. Pharmacognosy. In: Phenols and phenolic glycosides. 13 th ed. London: ELBS; 1989; p. 223-24, 246-49. Harborne JB. Phytochemical Methods: A Guide to Modern Techniques of Plant Analysis. 3 rd ed. London: Chapman and Hall; 1998. p. 30-2. Schmolka IR. Artificial skin. I. Preparation and properties of pluronic F-127 gels for treatment of burns. J Biomed Mater Res 1972;6:571-82. Joshi M, Bolmal U, Dandagi P. Formulation and evaluation of cefuroxime axetil sol-gel for periodontits. Int J Pharm Pharm Sci 2013;6:498-503. Isenberg HD. Clinical Microbiology Procedures Handbook. Vol. 1. Washington, DC: American Society for Microbiology; 1992. Jones DS, Woolfson AD, Brown AF, Coulter WA, McClelland C, Irwin CR. Design, characterisation and preliminary clinical evaluation of a novel mucoadhesive topical formulation containing tetracycline for the treatment of periodontal disease. J Control Release 2000;67:357-68. Armitage GC. Periodontal diagnoses and classification of periodontal diseases. Periodontol 2000 2004;34:9-21. Aslani A, Ghannadi A, Najafi H. Design, formulation and evaluation of a mucoadhesive gel from Quercus brantii L. and Coriandrum sativum L. as periodontal drug delivery. Adv Biomed Res 2013;2:21. Park KM, You JS, Lee HY, Baek NI, Hwang JK. Kuwanon G: An antibacterial agent from the root bark of Morus alba against oral pathogens. J Ethnopharmacol 2003;84:181-5. Sohn HY, Son KH, Kwon CS, Kwon GS, Kang SS. Antimicrobial and cytotoxic activity of 18 prenylated flavonoids isolated from medicinal plants: Morus alba L. Morus mongolica Schneider, Broussnetia papyrifera (L.) Vent, Sophora flavescens Ait and Echinosophora koreensis Nakai. Phytomedicine 2004;11:666-72. Petti S, Scully C. Polyphenols, oral health and disease: A review. J Dent 2009;37:413-23. Evans CE, Banso A, Samuel OA. Efficacy of some nupe medicinal plants against Salmonella typhi: An in vitro study. J Ethnopharmacol 2002;80:21-4.